Fantasy football is great! It’s also not the only way many people enjoy combining their money and sports. For those who want individual game picks, PFF Greenline is live, and man is that crucial. But for those who are looking for prop bets, the PFF Fantasy team has picked out their favorites for the 2018 season. Below are the favorite picks of our staff, with the site offering each bet and an explanation why. We haven’t seen Wentz play in a game since he tore his ACL last December, and we may not until he laces it up in his first regular-season game in 2018, which will hopefully be in Week 1. That means this season-long prop pick could lose in early September, but every choice has risks. I like that this gives me a +900 return on the player who had the second-most team plays per game within five yards of the end zone last season and who threw passes on significantly more of those plays than quarterbacks like Blake Bortles and Jared Goff who share their backfields with star power backs. The Chiefs’ backup quarterback is Chad Henne, unless it’s Matt McGloin, which is a fun way of saying Mahomes is 100 percent definitely getting 16 starts as long as he stays healthy. You likely couldn’t find a scouting report on Mahomes coming out of college that didn’t include the phrase “high-risk/high-reward” somewhere in it, as he ranked second in the nation in big-time throws in 2016, but also third in turnover-worthy plays. Andy Reid has never been known for having an offense with a lot of turnovers, but Mahomes could be in line to change that. Yeah, yeah, I’m picking two different guys from the same bet. One of them is going to do it. 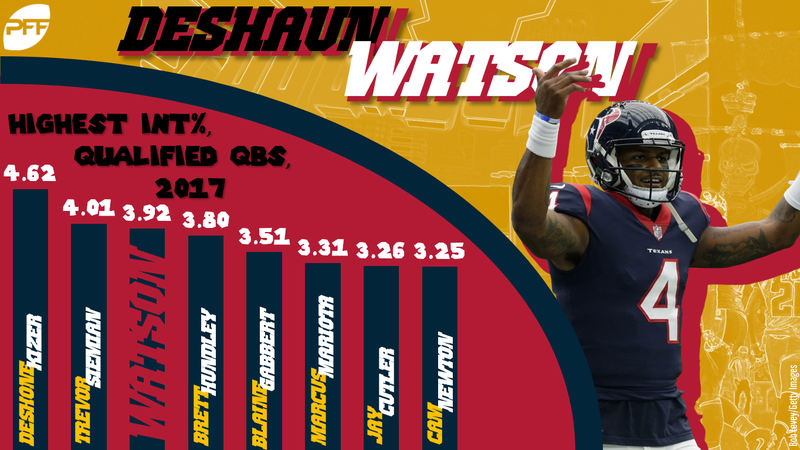 Watson was a sensation across seven games as a rookie in 2017, but so much of his game screams regression. And he averaged 25.0 fantasy points per game despite the third-highest percentage of interceptions thrown in the league. If I’m right that he’s a bust in 2018, this bet could be a nice one, even from a guy tied for the worst return on the bet. This is a bet I’ve just added in the last day, but it’s borne of the sudden worries we all have to have about the Dallas running game with the deteriorating offensive line. Travis Frederick has Guillan-Barre — we don’t know if or when he’ll be able to play again, but it could be later rather than sooner. Zack Martin is struggling with injury. Connor Williams is slates to start at left guard and has struggled in the preseason. Elliott isn’t going to end up with 600 yards or anything — he’ll still be good — but this bet requires him to put up a rushing total that has only been reached once in the last two years (admittedly by Elliott in 2016) and five times in the last five. It’s too high. If we remove last year’s leader (DeShone Kizer, now the backup in Green Bay), the top two in interceptions were Newton and Marcus Mariota. While Mariota leading a more run-friendly offense, the talk in Carolina has been about new offensive coordinator Norv Turner trying to improve the passing game. That could either go very good or very bad and if the Panthers are forcing something on Newton, it could lead to more bad throws. Rivers has finished in the top-five of this category in four of the last five seasons but has yet to come on out on top. Yes, he’s losing tight end Hunter Henry but he’s gaining a healthy 2017 first-rounder Mike Williams to his tool chest, which should only help the offense stretch the field. Last year was the first time since 2011 that Thomas failed to reach the 1,000-yard mark. Prior to that, he’d hit 1,000-plus yards in five-straight seasons. He hasn’t had fewer than 140 targets in any of the past six seasons. Over the past 10 years, 84.2 percent of all wideouts with 140-plus targets have netted at least 1,049½ yards. Thomas is getting a massive upgrade at the quarterback position with Case Keenum, our No. 4 quarterback in adjusted completion percentage (76.5) last year. He’s no longer feeling bothered by hip issues, and the coaching staff in interested in getting him the ball no matter where he lines up at wide receiver. Our entire staff agrees that Thomas should be someone on your draft board this year. Hitting 1,049-plus yards shouldn’t be an issue for the perennial 1,000-yard receiver. If healthy, Gronkowski can legitimately contend for the most receiving touchdowns on an annual basis. 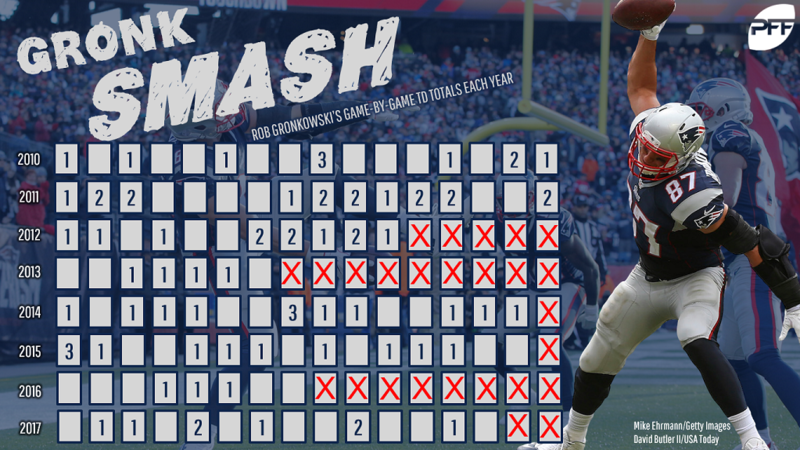 Putting this line under double-digit touchdowns makes this wager more indicative of whether Gronkowski can play through all 16 games rather than whether he can surpass the 8.5 touchdown benchmark. I’m buying. Julian Edelman’s four-game absence should increase Gronkowski’s target share and red-zone targets to begin the year, giving him a jump start on reaching this goal. His schedule doesn’t hurt either, with two of his divisional rivals — the Jets and Dolphins — ranking top-five in most touchdowns allowed to opposing tight ends each of the past two years. Oh and not to mention, over the past decade, Gronkowski is the second-most efficient touchdown scorer in the league. It wouldn’t be surprising in the slightest to have this wager paid out by the Patriots’ Week 11 bye. Fitzgerald has topped 1,000 yards in three straight seasons and despite the quarterback change and the questions around the offense as a whole. If he stays healthy he’ll likely get there again, or at least close enough to hit here. Durability is a concern with Fournette, but if healthy he’ll be a serious contender to lead the NFL in rushing attempts as the Jaguars’ workhorse running back. He’s money at the goal line, having scored on six of his 11 rushing attempts inside the 5-yard line as a rookie. Gurley scored 19 times a year ago, but regression seems almost inevitable. The schedule is tougher, teams have a year to study tape on the Rams offense, and there are even more weapons than a year ago. Aside from Gurley’s effort a year ago there have only been four other instances of a running back breaking this mark over the past five years. Bovada has odds listed for 15 quarterbacks, and it’s likely one of them will lead the league in interceptions. But is it five times more likely? Betting the Field gives us a numbers advantage, and it goes beyond “our 17 is greater than their 15.” A preseason or September injury to one of the listed passers reduces Bovada’s chances, while increasing ours. An early injury to a non-listed quarterback still increases our chances. Any backup who plays a large chunk of the season is a contender to throw the most interceptions. Bovada does not list any rookie quarterbacks, one year after a rookie led the league in picks. Josh Allen, Josh Rosen, Sam Darnold, and Baker Mayfield have reasonable chances to play all or most of the season. Darnold and Rosen are the most likely to start from Week 1, and they’ve got the shakiest offensive lines. SCUD missiles think Allen is inaccurate. Bovada lists Joe Flacco, but not Lamar Jackson. Jameis Winston will miss three games – no small thing – but is part of the Field. He threw the second-most interceptions in 2016 while sporting the fourth-worst interception rate – one spot better than Case Keenum, who also isn’t listed. Interceptions are fickle. Sometimes a good quarterback can lead the league, like Philip Rivers did two years ago. Peyton Manning came in second three years ago, and he had the highest interception rate. We could see Carson Wentz, Matthew Stafford, or any NFC West passer win the bet for the Field without shocking anyone. Banking on chaos in the NFL will work often enough to come out ahead, especially when you’re getting five-to-one odds.